$30.00 "Hunters at Rest," chromed cigarette case based on Vasily Perov's famous 1871 painting now in the State Tretyakov Gallery in Moscow. Reverse shows two wood grouse (or capercaillie) debating if they have anything to fear from the three hunters. In excellent condition. $65.00 Cigarette case features a marshland bird perched on a lakeside tree stump, chromed steel circa 1950s/1960s. 4 1/4" x 3 1/4" x 5/8". $60.00 Moscow-themed Cigarette Box, birchwood and anodized aluminum, circa 1960, features a view of the Spasskaya tower framed by two panels that replicate medieval wall decorations in the older Kremlin palaces. $55.00 Leningrad Cigarette Case in chromed steel featuring bird's eye view of the Admiralty building, Cruiser Aurora and Peter and Paul Fortress. Nice and relatively uncommon piece form around 1960s, in excellent condition. $250.00 Porcelain Ashtray "Soccer", Dulevo Porcelain Factory, dated 1959. This extremely uncommon "Soviet Ambience" item from the period of the "Khrushchev Thaw" appears to be a throwback to much earlier era. In excellent condition. 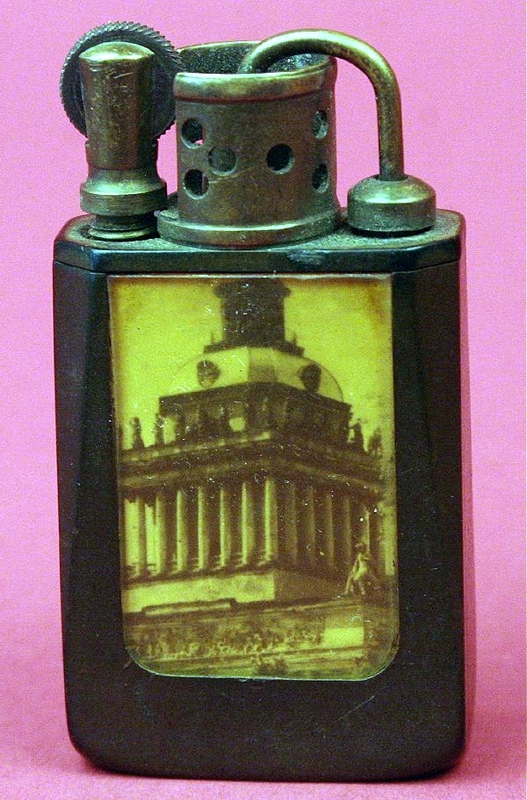 $25.00 Kremlin Matchbox Holder, by Pobeda Factory in Moscow, circa 1970s-80s. An attractive and relatively uncommon piece.